Energetic adults and kids can enjoy sport and games at the sportsground – there are regular organised matches, or perhaps you’ll get together with some of your new friends for a game of basketball or five-a-side! For the children, there’s our adventure playground with swings and things to keep them amused for hours! 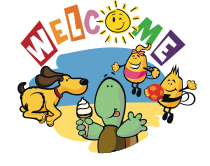 Welcome Family is all about making sure that your kids have a fun filled holiday and there is great holiday entertainment every morning and evening to match your kid’s energy. Come and watch all the big matches and more on our big screen TV in the Lounge Bar. All Sky Sports Football matches will be shown and World Cup matches too! Suitable for toddlers to teens, it has slides, swings, climbing frames and monkey bars. 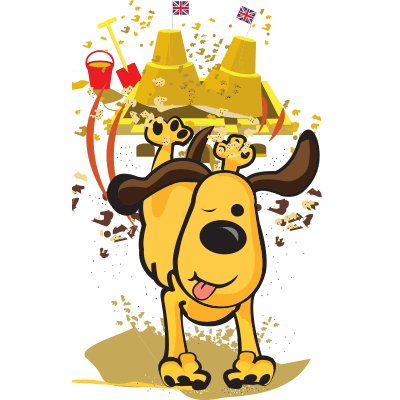 At the amusement arcade and games room you’ll find many games which will keep you amused for hours including air hockey, pool tables, dance mat, coin drops, grabbers and fruit machines. On site we have a Pottery Painting Studio and Coffee Shop, gift shop, chip shop and sweet shop. Just across the road there are two mini supermarkets and Sainsbury’s is just a 5 minute drive away. Pottery painting studio and coffee shop. Create lasting memories and personal gifts to take home. All inclusive prices start from just £7. Our Launderette has token operated washers and driers with washing liquid and fabric softener included, plus ironing facilities. Tokens are available to purchase from reception. Kids and adults can enjoy sports and games at the all-weather sportsground. There are regular organised matches, or perhaps you’ll get together with some of your new friends for a game of basketball or five-a-side football. Our Crazy Golf is FREE so why not try out a game of crazy golf on our unique fun golf course? Mums and Dads can join in too! When you book with us you won’t get any last minute surprises because the price you see is the price you pay. Linen is included in the price of all our short breaks and holidays. We are pleased to offer our guests FREE Wi-Fi throughout the park*. One connection per unit is provided free of charge. *Please note that connection is not guaranteed throughout the park, however it is always available in our reception. One connection per unit is provided free of charge. If you have would like to have more than one connection these can be purchased from reception for £1 per day per connection. With 4 funtastic swimming pools, families can swim whatever the weather! All pools are manned by fully qualified lifeguards. There is a fun pool, toddler pool and bubble pool and a separate sports pool for the more serious swimmers. 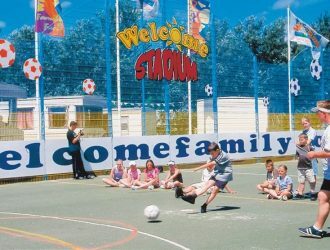 Welcome Family Holiday Park is just a short level walk from Dawlish Warren’s Blue Flag beach. RNLI lifeguards patrol the beach making it an extra safe beach for families. The beach stretches out 1.5 miles and is backed by sand dunes.There is a section of the beach which dogs can enjoy all year round. Grown-ups need not apply! Strictly for kids, our intrepid adventurers can put all the swash and buckle into the evening activities, where they can play party games, enter competitions and watch movies, basically anything that starts with fun and ends with laughter! Please note that parents should remain within Crusiers Club whilst their children are in Dougies Den; children under 5 must be accompanied by an adults within Dougies Den. Welcome Family has a varied selection of pet and dog friendly caravans, bungalows and lodges. Part of Dawlish Warren beach allows dogs all year round making Dawlish Warren a great place to bring your dog on holiday. FREE nightly entertainment is offered in the Cruisers Club. 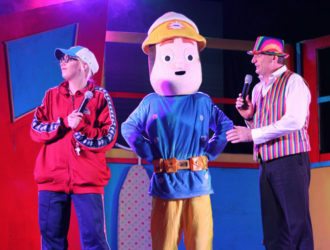 Our fantastic entertainment team put on highly acclaimed shows for all the family. There are also regular early evening shows especially for our younger guests. The Welcome Bite boasts an extensive menu with something to suit everyone. Breakfast, light snacks and delicious main meals are available to eat in or takeaway. Look out for our money saving deals, helping you feed the family for less. Also on site we have a Fish and Chips shop and Paint Hub Pottery Painting and Coffee Shop.